Late on Friday, Jade from Google announced in the Google Places Help forums that you can now merge your Google+ Business page with your Google+ Local page to have the Google+ Local information with all the social features of Google+ on the same page. You can combine the best of Google+ Local with Google+ Business Pages on the same page. Jade shares one local shop that did this already named the The Meatball Shop where you can see the Google+ posts and local data all on the same profile. Click on Verify now on the right side of the page. 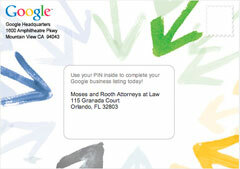 You'll need to verify that you're representing your business by having a postcard sent, even if you're a verified business owner on Google Places for Business. Also note that verification will only work for pages created in the "Local Business or Place" category in Google+. If you've requested a postcard for multiple Google+ pages, make sure to click on the name of the business that the postcard is for. Michael Blumenthal has a detailed step by step walk through with screen shots on how this works on a specific example. Yes! There are two types of administrators -- owners, and managers. Read more about each role’s capabilities here. Can I have one social local Google+ page that links to my many locations? No, at this time, we only support one social local Google+ page linking with one location. Currently we only support verification of pages made in the local business/place category. You may make a new page in that category to access verification, but we cannot automatically move content or followers. There is currently not a way to change the category of a +page. What about if I’m a service area business with hidden address? The new verification process does not currently support service area businesses with hidden addresses. What if I’ve just got a local Google+ page with reviews (in Google+ Local) but don’t have a social +page? You may create a +page in the “local business/place” category to have access to verification, if you would like. We hope to offer the upgraded experience to all local businesses, soon, but currently, verification of the social +page is the only way to get the combined/upgraded pages.